Post Election: Where Do We Go From Here? $25 before Nov. 23, $35 after. STREAMING ON FACEBOOK LIVE from 12:10 P.M.
Register for events at LWVPBC.org or by contacting Estelle Friedman at efriedman@bellsouth.net or (561) 968-4123. ELECTION DAY IS ALMOST UPON US! 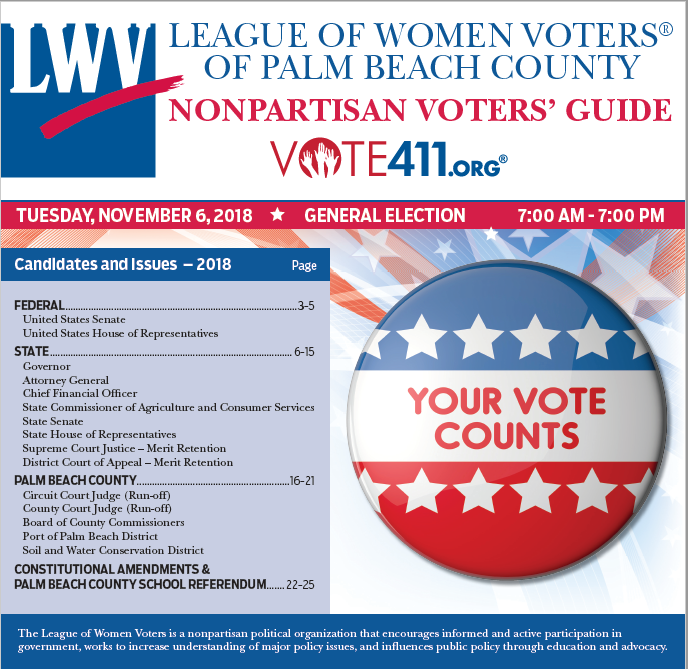 PALM BEACH COUNTY'S VOTERS' GUIDE IS HERE! Download extra copies by clicking button. To see the full LWVPBC Voters' Guide, please click the button below. 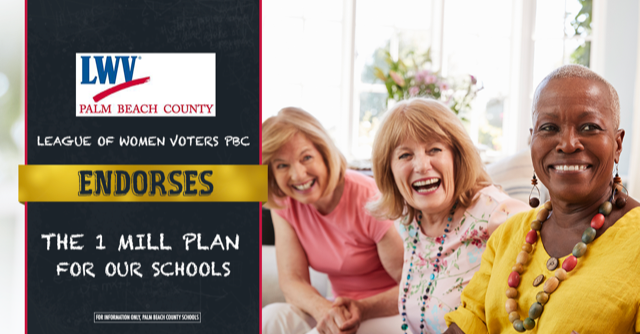 The League of Women Voters of Palm Beach County is proud to be joined by the Palm Beach County Classroom Teachers Association and the Palm Beach County Council Parent Teacher Association in supporting the "1 Mill" Plan for our schools. And we're going to see Downton Abbey Exhibit. Our next outing is to the Downton Abbey Exhibit located at City Place, 575 Rosemary Ave., West Palm Beach. It is on the NW corner Rosemary Ave. and Hibiscus St., the old Macy's building. It is scheduled for Wednesday, Dec. 5, 2018 10:30 A.M. The tour takes between 60 and 90 minutes but you may stay as long as you wish. This is a great way to meet other League members. Gather a group and have lunch at one of the many restaurants in the area. It promises to be a fun day trip. The cost for those under 65 is $37.00. For those over 65, the cost is $35.00. League members are gearing up to persuade lawmakers to hear a new National Popular Vote bill in the 2019 legislative session. The statewide NPV team is advocating a law to guarantee that the winner of the most popular votes in all fifty states becomes the U.S. President. The goal is to align the electoral system with the will of the American people for the first time in our nation's history. LWVFL NPV Chair Kathleen Crampton has already met with state Representative Joseph Geller and Senator Victor Torres who have agreed to introduce a new NPV bill for 2019. 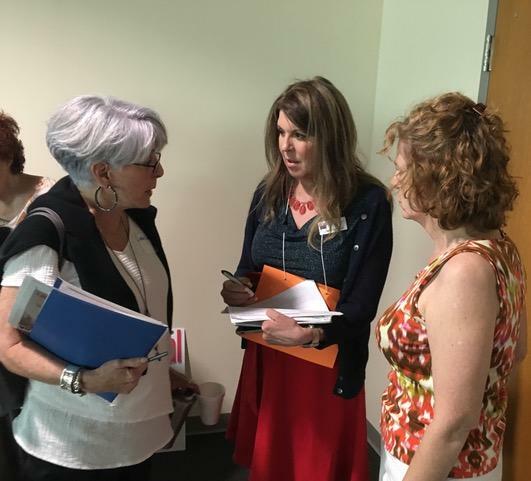 Kathleen and Deb Mazzaferro of LWV St. Petersburg have developed a statewide legislative plan, training league members how to network with lawmakers and staff on key committees. The League is hoping to maximize the number of bipartisan cosigners on the bill. NPV is gaining momentum nationally. In Michigan, the House of Representatives is considering a bill backed by a bipartisan group of 16 Representatives, including 14 Republicans and two Democrats. This comes on the heels of NPV being signed into law in Connecticut in May. In addition, three other states have NPV bills pending in their legislatures: North Carolina, Ohio and Pennsylvania. What seems to have pushed the issue to the fore in Michigan is the recognition that NPV would increase voter turnout and participation in the vast majority of states that aren't battleground territory. 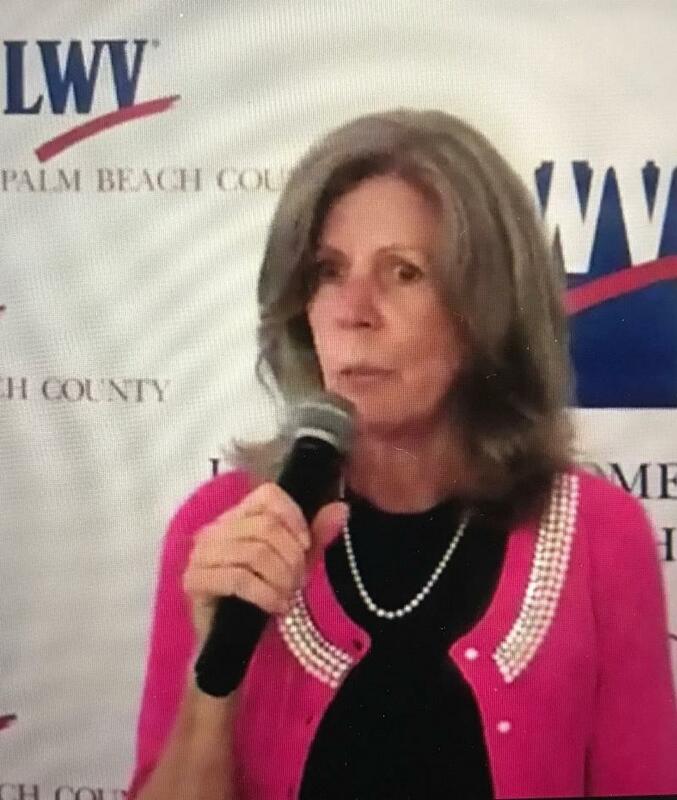 Meanwhile, in Palm Beach County NPV gained more than a dozen new potential supporters at the September 29 new member orientation for LWVPBC, many of whom will be getting a refresher civics course in how bills are passed, and may be drafted to go to Tallahassee in March to advocate NPV to lawmakers when the 2019 legislative session begins. So far, 11 states and the District of Columbia have passed NPV laws accounting for 172 of the 270 votes needed to make it the law of the land. Florida would add another 29 electoral votes to the tally. 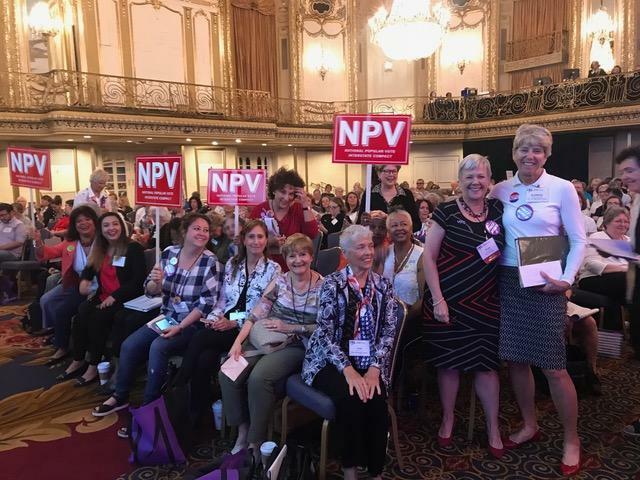 NPV Chair Kathleen Crampton, left, and LWVFL President Patti Brigham, right, stand at the National LWV Convention in Chicago in June. VACCINATION TIME! 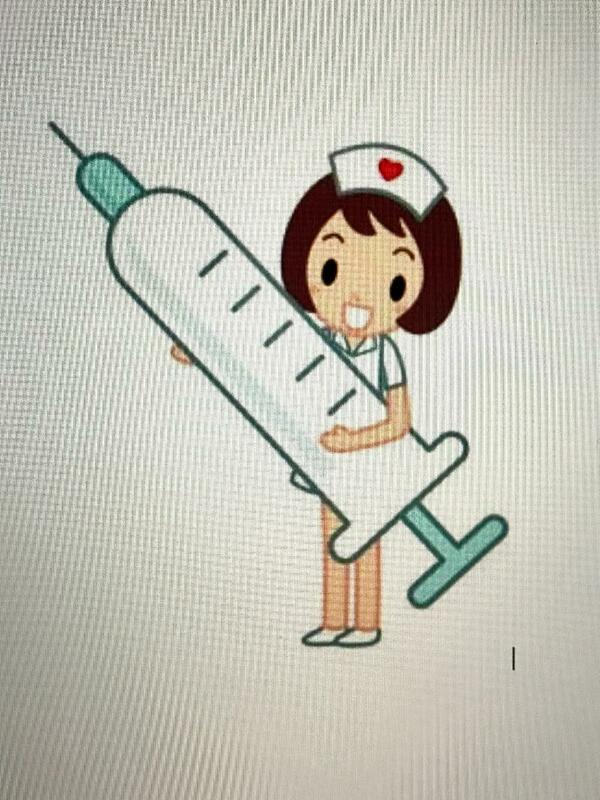 GET YOUR SHOTS NOW! The 2017/2018 flu season was a bad one. The flu and its complications killed approximately 80,000 people last year, many of whom were seniors. One hundred eighty of the fatalities were children! That’s the highest flu death toll in nearly 40 years. The CDC recommends the flu shot for everyone older than 6 months of age, with very few exceptions. ASK YOUR DOCTOR IF YOU ARE UNSURE! The most important vaccinations that seniors should discuss with their physician are those that fight flu, pneumonia and shingles. Flu shots must be repeated every year because there are always new strains. You should try to complete this by Oct. 31, however, it is never too late to receive a flu shot. The pneumonia and shingles vaccinations are different. Both are typically one-time vaccinations but recent changes (i.e., upgrades) may require you to be re-immunized, or may require a booster. Experts recommend herpes zoster (shingles) vaccine for anyone 60 or older. TALK TO YOUR DOCTOR OR YOUR PHARMACIST! Don’t procrastinate! Protect yourselves and your loved ones. Be safe, and be well. The Education Committee works to educate and advocate for the public schools of Florida and most especially, Palm Beach County. We are currently actively supporting the Palm Beach County School Board Millage Referendum, otherwise known as the 1 Mil Plan. The League of Women Voters of Palm Beach County has been working with various other groups to make the 1 Mil Plan successful in the General Election. The purpose of the levy is to fund over 650 art, P.E., health, music, choice and career education programs and teachers. The referendum will allow the district to hire more school mental health and guidance counselors as well as more police officers. 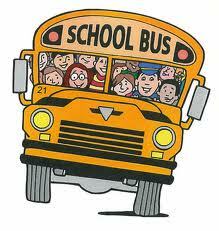 The Plan will also allow for supplementing teacher salaries based upon length of service in the district. This gives teachers an extra financial incentive to continue teaching in Palm Beach County providing academic consistency. The League has endorsed the passage of this important Plan. Other activities of the Education Committee have included studying and compiling information sheets to give to interested parties on charter schools, school funding, and legislative priorities. The Education Committee is also working with members of the League at the state level on planning a possible Celebration of Public Education in either May or September. We invite you to join the Education Committee and work with us on the important issue of Public Education in the State of Florida. Our next meeting will be November 10th 11:00am - 1:00pm at the Book Cellar-801 Lake Ave. Lake Worth, 33460. Red tide refers to a natural occurrence of microscopic toxic algae called Karenia brevis (K.brevis). It blooms up to 40 miles offshore in the Gulf of Mexico. When it blooms, it is reported to poison sea life. Red tide, which grows in salt water, is not a new phenomenon. It was documented along Florida’s Gulf coast as far back as the 1840s. Red tide forms offshore, and is then moved inshore by tides, currents, and winds. Once inshore, red tide can then feed off of manmade nutrients, prolonging or increasing the blooms. The recent freshwater blooms of cyanobacteria (blue-green algae), released from Lake Okeechobee, has complicated matters. Cyanobacteria lives in freshwater. When encountering saltwater, the algae quickly dies but the dead algae may provide nutrients to red tide blooms already in near-shore waters. Thus, the presence of blue-green algae exacerbates red tide. Red tide is common on the west coast where it is nearly an annual occurrence. However, the last full red tide forecast for Palm Beach County was in January 2008. How red tide recently got to Palm Beach County is a matter of debate, although the general theory is that it got caught in the Florida Current, which runs through the Florida Straits into the Gulf Stream. 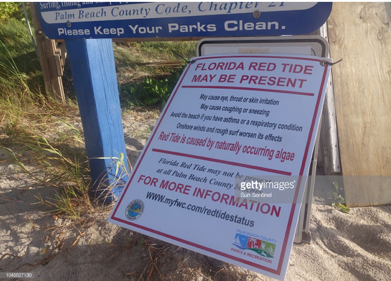 Officials recently closed many public beaches in Palm Beach County from Jupiter to Lake Worth due to beachgoer complaints of respiratory, skin, and eye irritations - red tide symptoms. Lifeguards were given full-face protective masks in an attempt to alleviate irritations. The Florida Fish and Wildlife Conservation Commission has been testing water samples. The good news : Reports released on October 9th showed low to non-existent levels of red tide along our coast. Tests are improving and beaches are now open. More good news : Help with the algae issue is now closer to fruition. A reservoir to hold Lake Okeechobee overflow and spare northern estuaries from harmful discharges recently won approval in the U.S. Senate. It was the final step for the legislation, known as America’s Water Infrastructure Act of 2018 , before heading to the president’s desk for signature. The U.S. House approved the bill last month. The $1.4 billion reservoir plan calls for a 10,500-acre above-ground storage area and 6,500-acre stormwater treatment pond, which could take 10 years to complete. 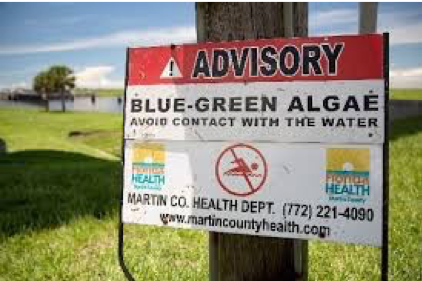 The reservoir slated for state-owned land in western Palm Beach County would help to lessen the blue-green algae blooms plaguing the St. Lucie and Caloosahatche rivers - a major step forward. Governor Rick Scott can't replace retiring Justices before he leaves office. Thanks to a lawsuit filed by the League of Women Voters of Florida and Common Cause, the next governor, and not Gov. 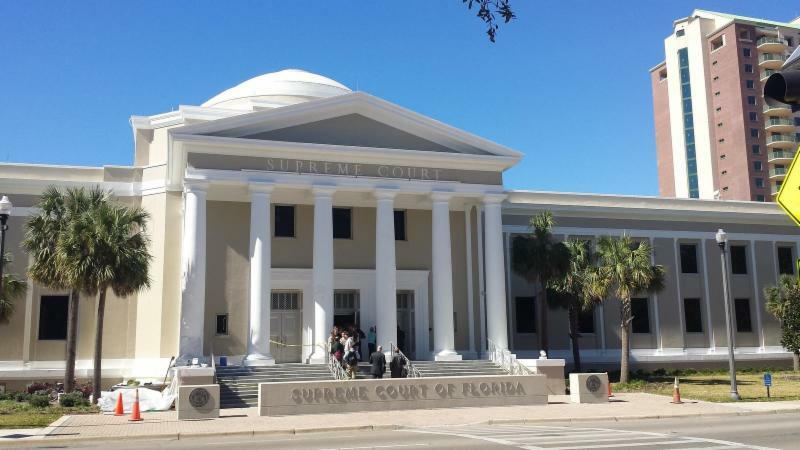 Rick Scott, has the authority to appoint three new justices to the Florida Supreme Court, the court recently ruled. Scott, who leaves office in January and is running for U.S. Senate, had repeatedly asserted the right to appoint replacements for justices Barbara Pariente, R. Fred Lewis and Peggy Quince, who will leave the court in January because they have reached a mandatory retirement age. 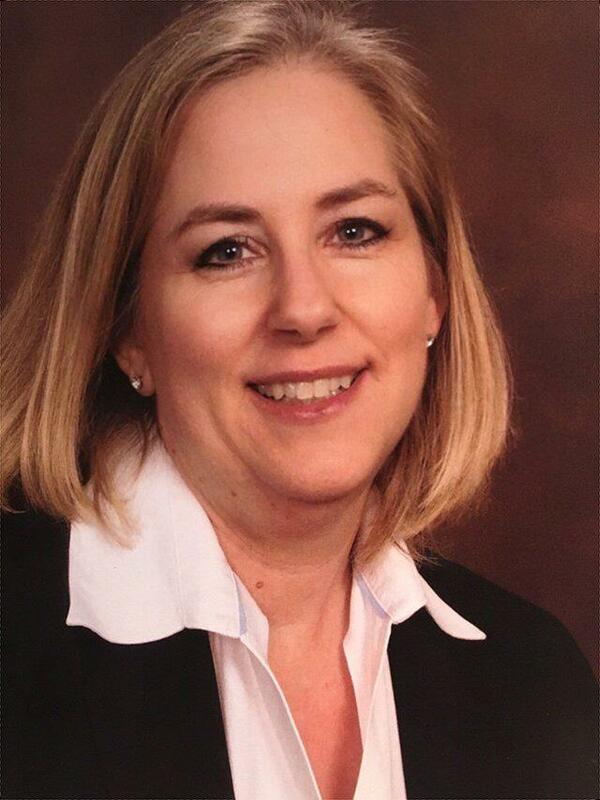 LWVPBC President, Karen Wilkerson , lost her daughter, Susan Kent recently. The Board and members of the League of Women Voters of Palm Beach County extend our heartfelt sympathies to Karen and her family. In Susan's honor, a memorial fund has been established with the donations going to LWVPBC Education Fund. If you would like to contribute, you may go to lwvpbc.org and hit the Ed Fund Donation button, or click the button below. On the ED Fund Donation page, you can enter all information, including "in honor/memory of Susan Kent" and whether you would like like your name published or to be anonymous. You may view Susan's obituary by clicking the button below. Having trouble logging into the new website? We have a fix! If you are using anything other than a PC and/or a Chrome browser, scroll down to the bottom of the screen (for instance, the home page) and look for a button for Desktop Mode and click on that. This applies to any Mac, iPhone and Android- also the Safari browser. There is a security protocol that sometimes gets enacted for some websites and this is the optional access link. You should see a Login page after that- if you don't, please let support know by emailing support@lwvpbc.org . We will help you directly. Please note support does not work on weekends. When (if) you get the Login page, go back to the password reset email and try the link. This will save you a few steps for logging in. Otherwise, you can always use the 'Forgot Password' link to get a new password. Palm Beach County residents will begin receiving their property tax bills this week. Tim Willmath , Chief Property Appraiser, and Anne Gannon , Tax Collector, introduced attendees to pertinent information on the ins and outs of county property appraisal and taxation. 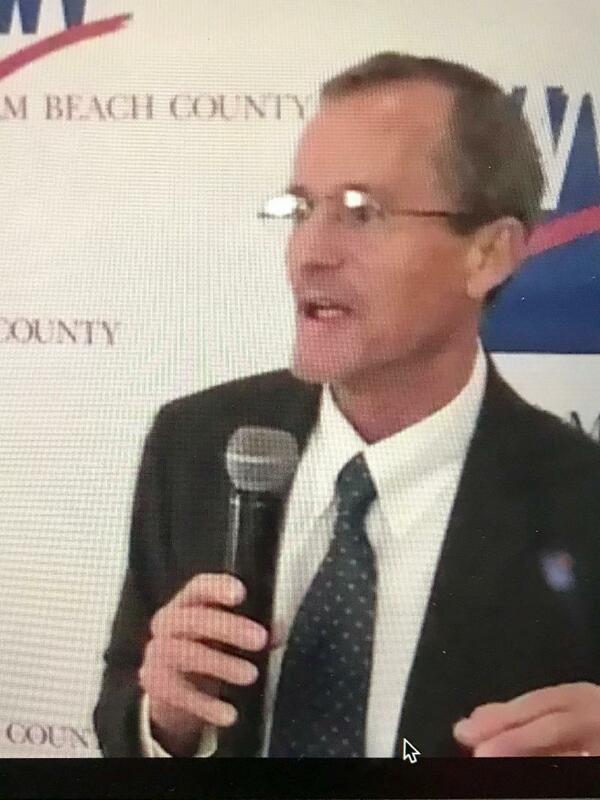 Wilmath told us that Palm Beach County is larger than 7 states & is ranked 3rd in population in Florida. He explained that maintaining data, determining value, and administering exemptions are the functions of the Appraiser’s Office. The county's assessed property has a total value of $265 billion. A primary responsibility is to make sure homestead exemptions are valid. Gannon described her office, with seven service centers, as a “1 stop shop”. The multiple functions of the Palm Beach County Tax Collector office include the issuance of drivers licenses, birth certificates (and soon death certificates), disabled person parking permits, SunPass, property/business tax, boat/trailer/vessel registrations, hunting and fishing licenses, TSA pre-check program, and the bed tax. Ann urges residents with rental property to make sure all rentals are properly registered. She gave the audience a lot of good advice not available on the county website, including tips for visiting the service centers. Tuesdays and Thursdays are the slowest days, but avoid the first of the month. She suggested bringing a book, making an appointment online if possible, not waiting until the last minute. She encouraged everyone to utilize the Tax Collector website as much as possible. She also discussed the proposed Amendments on the ballot. To view this Hot Topic, click the button below. Our Hot Topic events are streamed live on the League's Facebook page. Protect your family, your assets and support the League of Women Voters of Palm Beach County . “Own Our Tomorrow” is the League’s Campaign to help sustain our outstanding programs for generations to come. If you have a dream of helping the League you could also build a secure financial future for you and your family, eliminate the impact of taxes on appreciated assets or more…. All it takes is an Open Mind. 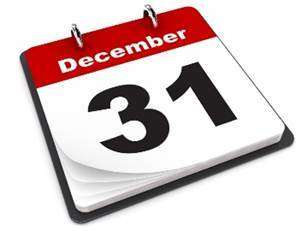 Only two months left for year end tax planning! Learn more now CLICK HERE or the button below. Don’t miss out! We have moved our bank accounts to the PNC Bank. The Voter Service Committee organized 250 volunteers to register 1955 people at the county high schools. They are planning to hold three voter parties. Bylaw changes regarding appointed directors and more opportunities for members to vote at our annual meetings were discussed. Members will receive copy of proposed changes. The VOTERS’ GUIDE has received rave reviews. It is now available in a pdf format on the home page of our site (lwvpbc.org). Just click on the picture of the cover. In November a planning workshop will be held to start the agenda and budget process. All committee chairs should plan to attend. LWVPBC is in good financial shape! LWVPBC has almost 850 members! We have had tremendous success with voter registration, our 2018 election Voters' Guide, and our Speakers' Bureau presentations of the ballot amendments. Our 10 issue groups are healthy and active. Our Hot and Cool Topics are keeping members and friends informed. Our Finance Committee has worked hard to grow with our organization. Here is an overview of our first 6 months of our Fiscal Year 2018-2019 (our fiscal year is April 1 to March 31 of the following year). Overall, we are in good shape. We are running slightly behind budget in both income and expenses (we planned for a big year). Note that Donations are behind budget: please know that most donations are booked to our 501(c)(3) Education Fund, which makes the donation tax free for the donor, and are used to fund education expenses. But as we anticipated, passage of the tax cut has cut into donations, and this is an area of concern for us. We are beginning our planning process for the next fiscal year. On November 17 our 25 committee and Issue Group chairs will attend a planning and budgeting workshop. We will provide you with detailed budget and committee plans in February, before the annual meeting in April. LWVPBC Finance Committee is made up of our Treasurer and Chair, Dorneth Weir , Linda Blash , Nancy Cohen , Joan Karp , and Mary Jane Range. LWVPBC welcomes Maxine Cheesman , President; Rita Wachs , Vice President; and Ellen Galkin , Secretary to the Ed Fund Board. Dorneth Weir serves as Treasurer of the LWVPBC and the LWVPBC Education Fund, and will be the liaison between both boards. In our continuing efforts for transparency, we will be providing updates on the budgets and finances of the League in upcoming editions. Making Democracy Work! The League of Women Voters, a nonpartisan, political organization, encourages the informed and active participation of citizens in government, works to increase understanding of major public policy issues, and influences public policy through education and advocacy.